All decisions concerning admission to Providence Academy are based upon the personal qualifications of the applicant, without regard to race, creed, color, or national origin. Furthermore, Providence Academy does not discriminate on the basis of race, creed, color, or national origin in the administration of its educational p olicies, admission policies, financial aid, athletic, and other school-administered programs. Providence Academy is a private, non-denominational, independent Christian school, educating students in a full-day Junior Kindergarten program through the 5th Grade (the “Lower School”), and in the 6th through 8th Grade (the “Middle School”). All prospective students should request admission to the School, using our online “Student Application Package”, and by submitting a $75 non-refundable application fee directly to the school office. Diagnostic entrance testing is administered to all new applicants. Jr. Kindergarten and Kindergarten evaluations affirm a child’s readiness for a full-day academic program. Primary areas of testing for 1st through 8th Grade include reading comprehension, spelling, and mathematical computation. These tests aid the School in making an appropriate placement of your child, and provide your child with the greatest opportunity for academic success. Providence Academy reserves the right to review all previous and other records, as deemed necessary. Evaluations are scheduled by Providence Academy office personnel as openings become available. Acceptance into Providence Academy will be determined after all items have been received, and placement testing has been completed and evaluated. In addition, all incoming Middle School students, grade 6-8, are required to conduct an interview with the Headmaster. The School will send you a letter of acceptance with instructions for completing our online enrollment contract. 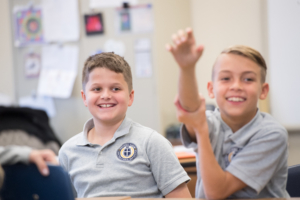 Providence Academy admits students of any race, color, national or ethnic origin to all the rights, privileges, programs, and activities generally made available to students at the school. It does not discriminate on the basis of race, color, national or ethnic origin in administration of its educational policies, admissions policies, scholarship programs, and athletic and other school-administered programs.